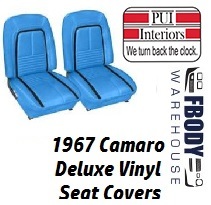 New replacement DELUXE 1967 Camaro front bucket seat covers. 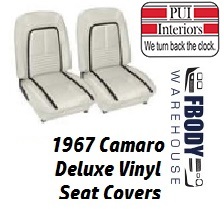 New replacement vinyl deluxe covers from PUI offer superior quality and fit for your early first generation 67 Camaro with bucket front seats. 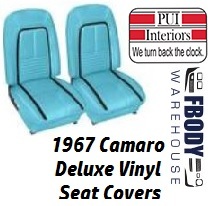 After 40+ years factory seat covers simply need replaced! 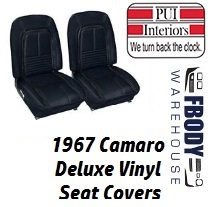 We offer a wide variety of seat covers for your first gen Camaro. NOTE read the color chart below as accent color may vary from stock image. 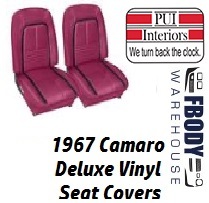 Seat covers are available in 6 stock factory matching colors. Use the drop down menu to select color desired. NOTE: We can ship to the USA and Canada only on this item. If shipping to Canada please use the drop down menu to select additional Canadian ship charge. NOTE: While we strive to provide fast shipping times, units can take from 7 days to 4 weeks for delivery. Need it fast? 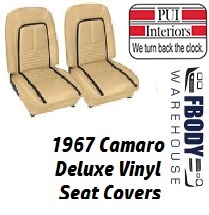 Simply call us prior to ordering and we can give you an exact shipping date for your items!